Featured In A Dateline Special As The Most Potent Physical Attraction Pheromone which comes in an unscented version which is virtually free of any pheromone smell and draws women close. 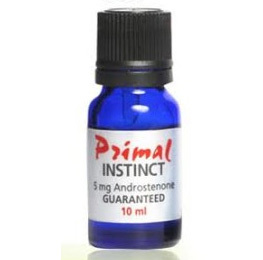 Primal Instinct contains 5mg Androstenone per bottle. Don’t be surprised if the next time you walk into the club wearing this stuff, you’re practically smothered with affection. If you’re ready to be the man you’ve always wanted to be, this pheromone product can help you succeed in social situations, business and love. As soon as you dab a few drops of this powerful product on your skin or clothes, you’ll feel like a brand new man. You’ll be strong, powerful, in control and ready to go after what you want as though it’s already yours. 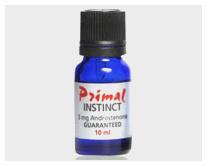 Primal Instinct Men’s Pheromone Product was highlighted on Dateline as the most potent pheromone on the market. What is Primal Instinct? It’s the natural human desire to be intimate, sexual and close to others. When you use Primal Instinct you’ll be amazed at how close woman want to be to you! Customer reviews of this pheromone product describe how users gets the attention of attractive women in different social and business settings! Ranked #2 in 2018 Top-Rated Pheromone Colognes, Primal Instinct contains 5mg Androstenone per bottle and comes in an unscented version which is virtually free of any pheromone smell and draws women close. Don’t be surprised if the next time you walk into the club wearing this stuff, you’re practically smothered with affection. This product is an excellent tool for getting the attention you want in business and romantic affairs. Pheromone products are a great ally in receiving the love and attention you deserve. 5 mg Androstenone Per Bottle!